From a young age, Vicky Fortin had dreams of working in an operating room, but she wasn’t interested in pursuing a career in medicine or nursing. She had her heart set on becoming a medical imaging technologist; and while interning in St-Jérôme, she discovered a field of medical imaging that merged her love of technology and the OR: interventional radiology. Interventional radiology is a medical specialty where radiology is used to perform minimally invasive procedures. Medical imaging technologists assist interventional radiologists by using ultrasound and a type of X-ray, known as fluoroscopy, to guide small instruments, like catheters and needles, though veins, arteries and organs. “Fluoroscopy is an imaging technique that uses X-rays to track the movement of an object in real-time,” explains Vicky. The insertion of a PICC line takes about an hour and parents are invited to stay with their child during the procedure. Patients under seven months of age are sedated with sucrose, which tends to have a natural soothing affect, while the arm is frozen with local anesthesia. For older babies and toddlers, chloral hydrate is used for sedation and they end up sleeping through most of the procedure, but for children aged three to five, general anesthesia is administered. Biopsies are also common in interventional radiology. In these cases, ultrasound is used to help localize and retrieve tissue from the organ or mass in question. The sample cells or tissues are then directly sent to pathology. On average, Vicky will see 15 to 20 patients a week; most of them newborn babies from the Neonatal Intensive Care Unit (NICU). “There are four medical imaging technologists who work in this sector, but we always work in pairs, because one of us works alongside the radiologist while the other one stays beside the patient,” says Vicky. In interventional radiology, medical imaging technologists are very involved in each procedure from beginning to end. “We have no nurses or Child life specialists in our sector, so the prep and interaction with patients is up to us,” she says. Before every procedure, Vicky will organize the sterile table, prepare the patient and set up all the monitors and equipment. 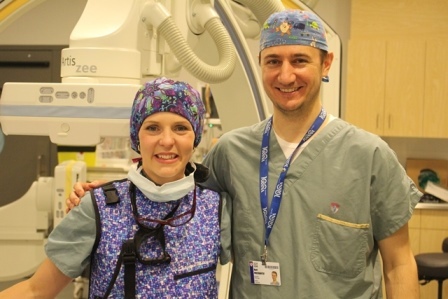 During the procedure, she assists the interventional radiologist by providing them with the right material, all while positioning, immobilizing and imaging the patient and controlling the quantity of radiation used. “We take four X-rays per second, but we don’t want to overexpose the child to unnecessary radiation, so it’s up to me to limit the area exposed to radiation,” she says. All of the interventional radiology suites sit across the hallway from the OR on the third floor. The space is shared by the Children’s team and the adult sector. “There are a total of four interventional radiology rooms. Three of them belong to the Royal Victoria Hospital, and one is dedicated to pediatrics,” she says. Procedures take place three days a week on Mondays, Wednesdays and Fridays, but Vicky is on-call 24/7 for emergency situations. In trauma cases where internal bleeding is a critical factor, patients undergo a CT scan in order to localize the source of the bleeding and then are immediately transferred to interventional radiology for an emergency procedure. Once there, fluoroscopy is used to navigate the guide wire and catheter. Contrast is injected into the bloodstream to better highlight the affected area on the imaging monitor and once the catheter is placed near the injury, tiny metal coils or foam particles, known as embolization particles, are released into the bloodstream and attach themselves to the affected area in order to coagulate the blood and stop the bleeding. “The particles dissolve and are absorbed by the body, but the coils stay there for life,” she says. Another critical case is when a patient presents with a narrowing of a vein or artery, thus causing high pressure in a vessel. In order to lower the pressure and reestablish proper blood flow, a catheter is inserted along with a deflated medical balloon. “The balloon is mounted on the catheter and is delivered over the wire until we reach the narrow section. At that point, we inflate the balloon and it opens up the vein or artery, and blood flow goes back to normal,” she explains. “We have different size balloons depending on the size of the child.” Both of these cases are rare in pediatrics, but do occur on occasion and Vicky is always ready to jump into action.